Designs by Lisa Somerville: Oh Happy Day! What a wonderful day! Took DS #1 to get his hair cut - the long shaggy look has been driving me up a wall - and since HS registration and pictures are tomorrow - he had to get it cut - I'm happy to say - we both agree this cut looks good (we'll he reluctantly agreed)....Great mail day too - today's mail brought me a package from my mom and inside was the long sought after Swiss Dot CB folder - I couldn't find this one to save my life - thanks Mom! I also received my comp copy of Rubber Stamp Madness and the Autumn Take Ten issue. Thank you to those who had voted for my cover option - although my cards did not make the cover - I did have 4 of my Artistic Outpost cards published on page 115. 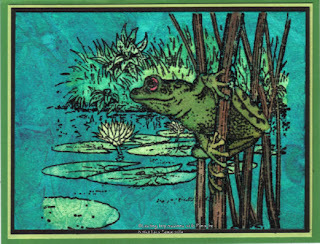 The card posted to the left is the one in RSM - stamps from Lasting Impressions with Panache - Frog Pond. And....I placed my new SU catalog order - my goodies should be here on Thursday (yep, I caved and expedited the order), I have some great ideas spinning, and can't wait to share them! Love the card--the colors are awesome! Love fun mail days! Almost as much as UPS deliveries. lol! Congratulations on all the published work! Can't wait to get my copy of Take Ten so I can check your cards out.